Exception is an event that disrupts the normal flow of the program. Thus, it is important to handle these exceptions. Like Java, Java Debugger (JDB) is also capable to handle these exceptions. The JDB catch command caught the exceptions at runtime. 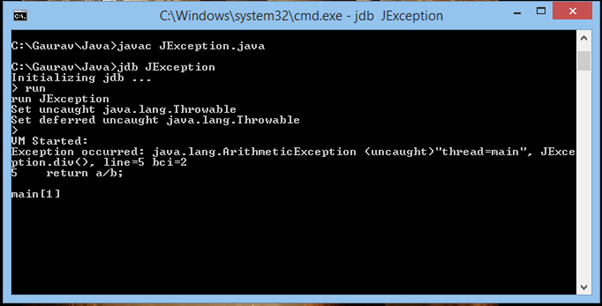 In this example, we will handle arithmetic exception through JDB command on console. Compile the above program and create a JDB session.